Our sixth race of the season was at Watkins Glen International in the beautiful Finger Lakes region of New York. Unfortunately, the weather made this weekend a little less beautiful, as it rained every day we were competing. Having said that, this race was still very special to us because it marked the debut of our new Honda Civic Si. The whole team was very excited to be running the new car. Now, all three of RSR Motorsports’ cars are the new Civics, which makes things easier and more consistent for the team. I was excited to be in the new car for many reasons. The new Civic has a 2.4-liter instead of a 2.0. More power! Also, it’s nice to be in an updated car with brand new equipment and instruments. Another cool thing about the new Civics is that HPD supplies the race ready engines and has a ready supply of suspension components and materials to support the Honda teams. This makes things a little more reliable and consistent throughout the paddock. Not to mention, I think the look of the new car is better. Before heading to Watkins Glen, we wanted to make sure the car was going to be ready for its debut. We didn’t want to just finish at the Glen; we wanted to win. Since it had never been raced before, we had to break it in. One week before the race, we took it to Nelson Ledges in Northeast Ohio, a somewhat local track for me. This track was the venue for the first time I beat my dad in SCCA’s Sports 2000 National class. So, it brought back some memories testing there. It is perhaps the bumpiest and fastest track in the country, which meant it was a great place to test. If you can go fast at Nelson, you can go fast anywhere. After a two-day test, we learned some valuable information and were ready for the Glen. As I said, the weather was not exactly beautiful for our race weekend. We only ended up getting in one dry session before qualifying. So, mostly all of our testing was in the rain. With little dry testing, it was disappointing because we wanted to make sure our car was going to be the best it could be for the race. However, after qualifying we knew we had a great car. I was sitting P1, on the pole, for the race with a new track record. I couldn’t have asked for a better car from the team. The race started off very well, and I led my entire stint, which was about the first hour of the 2.5 hour race. Changing conditions made this race a tough strategy call. It would rain, then stop, and then rain again. Our car seemed to be handling the conditions nicely though. We were running very well, but a tiny mistake from Owen cost us six positions early on in his stint. It was hard to make those back up. The race ended with a last lap shootout after a caution period. Owen was in 7th at the start of the last lap. With some great driving, he passed three cars and we wound up 4th! Overall, a pretty solid debut weekend for our new Civic. Honda cars also finished 2nd, and 3rd, a great performance for Honda to back up the podium sweep at Mid-Ohio. After the race at the Glen, we moved from 15th in the championship to 8th. Honda is still in a close 3rd in the Manufacturer’s championship. The next race is at Indianapolis Motor Speedway for the Brickyard 400 weekend July 26th. I’m going to be a finishing driver, driving the #198 Honda Civic! I’m really excited and looking forward to the opportunity. 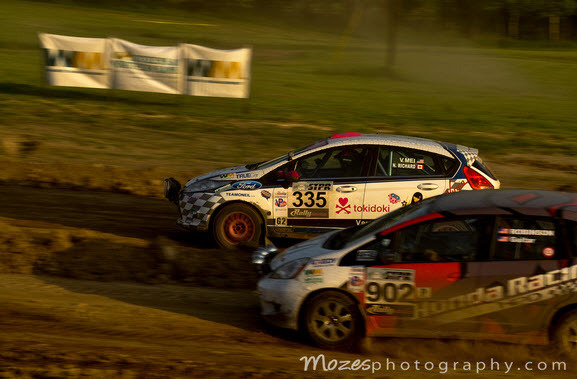 Team Honda Research partnered with Honda Performance Development to showcase the B-Spec Fit developed specifically for Rally competition at the third round of the Rally America National Championship. 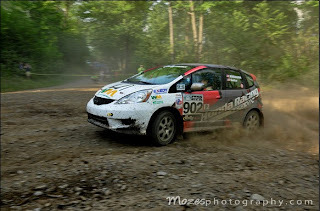 As one of the oldest rallies contested on the Rally America circuit, Susquehannock Trail Performance Rally [STPR] is also a favorite of drivers, due to the smoothness of the circuit. “We know that roads like this tend to favor the high-powered cars, but, as long as James doesn’t lift, we should be able to keep up!” said Jordan Guitar, co-driver for the B-Spec Team. Look for the THR B-Spec Fit at the next round of the Rally America National Championship Series, on July 26-27th in Newry, Maine. The fourth race on the Rally America National Championship schedule and one of the oldest rally races on the schedule, Susquehannock Trail Performance Rally (commonly known as STPR) began in 1977. It is not only the oldest, but it is also the fastest rally in North America. With roads consisting of clay and gravel, the course is slippery, fast and extremely dangerous. Drivers travel at speeds reaching 100 MPH through densely wooded roads. The speeds, combined with the dangerous course, ensure that this rally is not for the faint of heart.